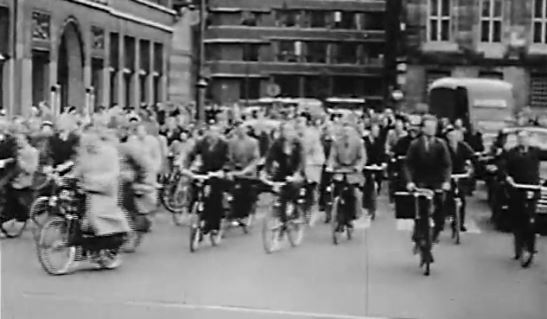 The streets were packed with people on their bicycles in Amsterdam in the 1950s. There were even more people cycling than today. All kinds of people on bicycles, men and women, younger and older people. That hasn’t changed at all. Some of the more typical Dutch cycling habits are already very old. Cycling with your dog is one of them! 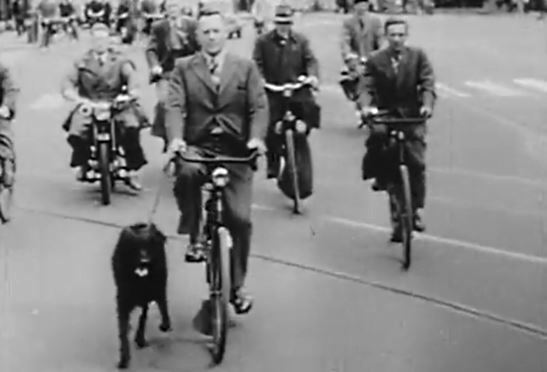 Dutch cycling habits have been around for quite a while. 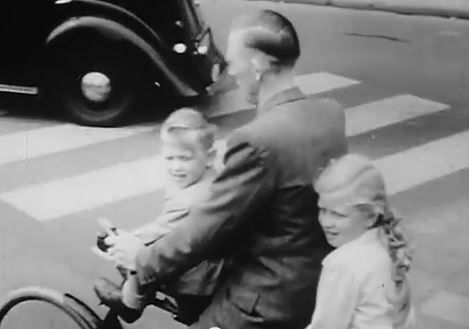 Dutch dads could still be seen riding around with two kids like this today! 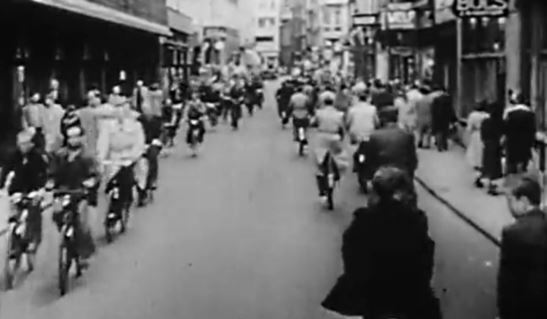 In the 1950s the streets were dominated by people cycling. That is again how it is today but motor traffic still gets a bit too much space and attention, even today, even in Amsterdam. 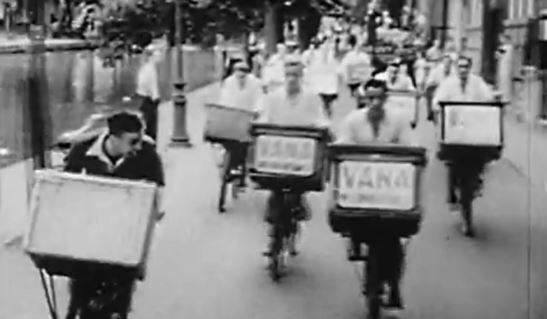 Most of the cargo bikes in the 1950s were used for professional reasons. The video shows a butcher boys race! 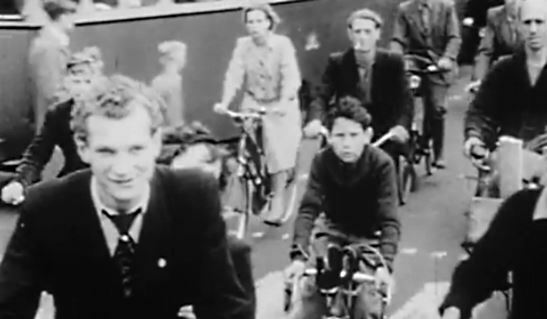 Video showing a light-hearted American view on cycling in Amsterdam in the 1950s. 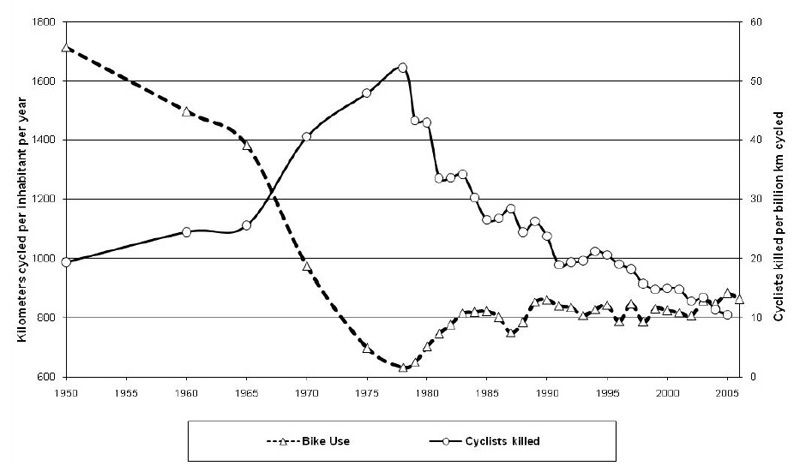 The Dutch cycled a lot more per person in the 1950s than they do now. The key factor for that difference: in the 1950s there were fewer cars. From “Making Cycling Irresistible” by Pucher and Buehler. Savez vous quíl existe des visites guidees en francais a velo et dans les grands musees? Pour ceux qui on du mal a parler neerlandais. Was there no growth in cycling 1990 to 2005? According to this graph the distance cycled per person for the entire country is stable. For number of trips it can be very different. There are also very big local differences. In cities cycling increased a lot and in the countryside cycling decreased a lot. The two even out in graphs like this, but the differences between 1990 and 2005 are huge in how cycling and everything related to it (like parking your bike) feels. I can not derive that from the chart you’ve posted? In the 1950s the chart starts at 20 cyclists killed per billion km cycled, while we’ve been below that level (according to the same chart) since the 1990s, and are almost hitting 10 now. That makes cycling ‘twice as safe’ today! You are right. I misinterpreted the chart. I’ve corrected the text. Humor sure was different back then. Oh yes, a little gem… Internet is such a wonderful thing we are lucky to have. It is so instructive to see such images of Amsterdam in the 1950’s. No infrastructures for bikes because they were the traffic! 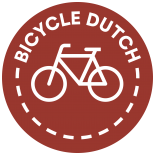 This entry was posted on 5 August 2013 by Bicycle Dutch in Original posts and tagged Amsterdam, bicycle culture, history, watching people cycling.